If you’re spending a decent amount of time in La Paz, Bolivia, I would definitely recommend checking out the nearby town of Coroico for a few days. While La Paz is mountainous, highly urbanized, and quite chilly, Coroico is a much warmer, smaller town in the “Yungas,” or jungle. We have visited Coroico several times for weekend getaways from the city, and each time we leave wanting more! The trip from Coroico to La Paz is a really easy (and cheap!) one. Take a La Paz minibus, trufi, or taxi to the bus station at Villa Fatima. There, you will find lots of buses headed to Coroico! The trip is about 2 hours and 30 minutes, and it should only cost you about 25 Bs. The scenery is gorgeous – especially if you get lucky with a clear day free of fog! Looking down at the winding road to Coroico from the Cumbre. 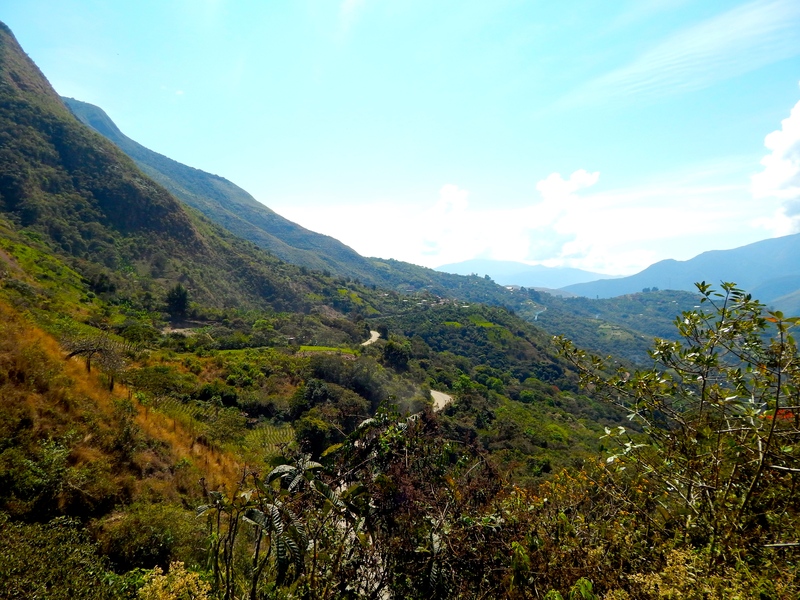 Another way to get to Coroico, for you more adventurous types, is to bike the famous “Camino de la Muerte” – Death Road. There are many companies that offer bike rentals and tours, including Gravity. I highly recommend using Gravity. Even though it is one of the pricier options, they use extremely high quality mountain bikes, the guides are both fluent in English and excellent mechanics, and they provide you with safety equipment and a yummy lunch at the end of the tour. There are plenty of hotels and places to stay in Coroico, but if you’re looking for a more unique option, consider La Senda Verde animal refuge! This ecolodge offers not only unique housing, but also a chance to hang out with some awesome jungle critters! It is also the ending location of the Gravity Death Road bike trip. Housing options include eco-cabanas that sleep up to 5 people, eco-huts for smaller groups of 1 or 2, and last but definitely not least a treehouse that sleeps up to 4 guests. The rooms are clean despite being surrounded by various animal friends. Just make sure to shut the doors tight so curious monkeys won’t get in and cause mischief! The animal refuge has a restaurant on site, and workers offer tours where you can see the birds, monkeys, caimans, tortoises, and even rare speckled bears up close. We really enjoyed our stay at La Senda Verde. The hosts were really gracious and even helped us out with finding transportation and other activities to do in the area. Plus I got to live out my childhood dream of sleeping in a treehouse! Dare to sleep in a tree? There are many resort-style hotels to choose from in Coroico, such as Hotel Esmeralda or Hotel Gloria. While all of these hotels provide private rooms, swimming pools, and in-house dining, many of them are pretty run-down and seem past their glory days. As long as you go in without expecting the fanciest, five-star hotel ever, you will enjoy your stay. The views from the rooms are absolutely gorgeous! The view from Hotel Esmeralda. This German restaurant, located a short walk from the main Plaza in Coroico, offers delicious food and a phenomenal view! To get to Carla’s from the plaza, face away from the church and head to the left corner. There you’ll see a flight of stairs to walk down. The restaurant will be on your left. Enjoy some yummy German food or just relax in a hammock for awhile! This restaurant in the middle of the jungle is a real find! Connected to a hostal, El Cafetal is a great place to eat delicious French food. The owners are just a lovely as the food! If you’re short on time and would rather stick around the main plaza, the family also runs Bon Apetit, which is just around the corner to the right if you’re facing the church. El Vangante Canyoning is a tour company that takes you rappelling down a series of waterfalls. We were picked up at our lodging and driven out from the city center until we had to go on foot. From there, you’ll hike until you get into the canyon, and then the adventure begins! This was a full day activity, and definitely one that will test your fear of heights, but it was a blast! We actually enjoyed this trip so much that we’ve done it twice! Lucio and Cristiam are excellent guides. One thing I would definitely recommend, however, is doing this activity during the dry season. Our rainy season endeavor was much more “adventurous” (and slightly scary!). P.S. – Don’t forget your bug spray. Zzip the Flying Fox is a 3 part zip-line over the valleys of Coroico. It starts in Yolosa (a short walk from La Senda Verde, actually) where you gear up with a harness of your choice – either traditional or superman style. Then, you ride in a truck up, up, up to the first zip-line to enjoy the views and the rush! M&M Coffee is an awesome coffee shop in Coroico, and we were able to actually visit the plantation where the coffee is organically grown, harvested, dried, and roasted! The owners, Mauro and his wife, were super welcoming and walked us through the entire coffee-making process. We were even able to help harvest the beans and separate them from the berries using a homemade bike machine! The coffee is also absolutely delicious, so even if you don’t have time for a tour of the plantation, stop by their coffee shop a few blocks up from the main plaza for a cup. High altitude coffee is the best quality, and with the way Mauro grows his among avocado, orange, and other fruit trees, even I could drink the coffee “sin azucar,” which is saying something! Coroico has so much to offer, and it is a fantastic day trip or weekend getaway from La Paz. If the snow-capped mountains have you craving a warmer jungle, hop on a bus (or a bike) and check it out! If you’ve visited Coroico, comment your suggestions below!